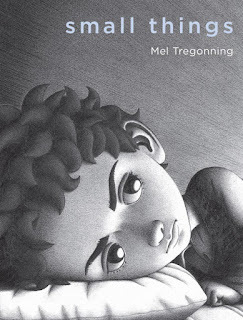 This wordless graphic novel for all ages is one of the most emotional books I’ve ever read. Because the story depends on examining the illustrations/artwork carefully, the messages it carries are accentuated many times over. The themes that make up the book are connected to loneliness: depression, loss, helplessness, anxiety, aloneness and fear. These collective feelings begin as small things that gradually evolve into a voracious appetite that consumes the sufferer. The boy is sad. He feels like an outsider, and no-one includes him in their circle because he is quiet and withdrawn. An insidious darkness has crept over him. It is absorbed by his skin therefore he carries it with him everywhere. Others can’t see it. That makes it worse. This darkness assumes many identities: exclusion, inferiority, sadness, fear, and heartache. These are bricks in a wall that builds around him. He feels parts of him are breaking away as he becomes more isolated and increasingly hopeless. He has stopped thinking clearly. All he can hear is his emptiness so he prefers silence. An effort made to reach the boy can’t get past the darkness which is now a relentless force. The boy feels like a failure. He has retreated from the world. His body is there but it’s just a shell. He feels cracked all over, feels he is falling apart, and tries to keep himself together. He is approached by a family member who persists. She knows how the boy is feeling. She exposes her damaged self to the child – the cracks, the pieces missing. That is when he realizes he is not alone in the way he feels. Other family members assure him that it’s common for people to feel anxious, have imperfections and fears. He begins to recognize something of what he feels in almost everyone around him and feels comfort in the sameness. He finds the courage to reach out to others. In 2008, Mel Tregonning began illustrating this graphic novel. In 2014, she took her own life. ‘Illustrator Shaun Tan completed the final three illustrations in Mel’s book in 2016’. My wish is that this review pays homage to Mel’s work.